Jed Davies is one of those special coaches who never stays still. His curiosity fuels a desire to look closely to why certain ideas and coaches work better than others. His first book on Tiki-Taka delved deeper into the system than anything else that was written on it, dealing not only on the coaching of the system but also its evolution and the philosophy behind it. Now he has turned his attention to Marcelo Bielsa. One of the most influential coaches of the modern game, Bielsa is widely respected as a visionary and a coach whose ideas have a wide reaching impact. Davies will analyse these ideas in an upcoming book (The Philosophy of Football: In The Shadow of Marcelo Bielsa) and spoke to Blueprint for Football over why he felt that the Argentine manager deserved so much attention. Blueprint for Football: What brought about the idea of this book? 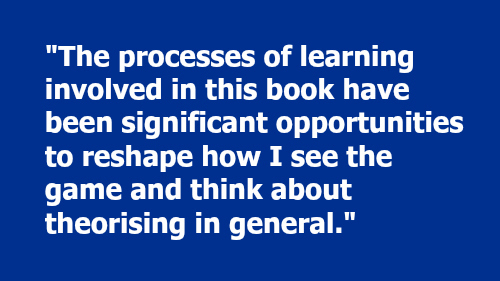 Jed Davies: As with my previous book ‘Coaching the Tiki-Taka Style of Play’, the idea to write a book is the idea to commit yourself to learning. Everything else is secondary. I was left dissatisfied after my previous book with the idea that I had leaned towards a style of play that is often misinterpreted and associated with maintaining possession over the duration of a game. That bothered me and I found my questions I was asking mentors, colleagues and friends were often around the misguided perception that possession ‘for possession’s sake’ and how that was to assert your dominance over a game through ownership of the ball – not always true to the idea of having ownership over the game. I owe my research’s intentions and messages to many who were generous with their curiosity. Guys like James Nash in Milton Keynes who would ask ‘what is the value of a pass?’, a question I attempted to answer knowing I’d never fully satisfy James’ curiosity. Other questions such as ‘what is the purpose for this rotation or that rotation?’ and ‘how can you evaluate team communication and decision making?’ led me down a very philosophical route in trying to theorise the game. This very same process is one Marcelo Bielsa has spent years making conclusions on and inspiring others to do the same: Mauricio Pochettino, Pep Guardiola and many others have travelled the same paths, paths often laid out before them by one man: Marcelo Bielsa. BfF: How long have you been working on it? And what was the process like? JD: I’ve been working on this book since 2013 and I’m still finding hundreds of new angles to look at the same idea today, but the time is now right to place a freeze-frame around the current document and have it published. I’ve always promoted the thought that the book is a snapshot of a certain time frame rather than the definitive answers to football. The processes of learning involved in this book have been significant opportunities to reshape how I see the game and think about theorising in general. I’ve taken flights around the world to Argentina and other countries to meet coaches or players who have worked either directly with or played under Marcelo Bielsa, and then stepped one further away and applied the same research methods to those who have played under or worked with those who represent the ‘school of Bielsa’ such as Pochettino, Dario Franco, Gerardo Martino and many others. The objective was to zoom all the way out and look at football from a philosophical standpoint and then zoom in on Bielsa and each of the common ideas that have become synonymous with Marcelo Bielsa: verticality, structures, rotation, movement and so on. While Bielsa is one of the toughest men in world football to get into contact with for an interview (trust me I’ve tried! ), he has such a diverse group of followers who have been influenced by Bielsa that the task to research the ideas of Bielsa was accessible, at least in Marcelo Bielsa’s shadows anyway. Hence the title of the book ‘The Philosophy of Football: In Shadows of Marcelo Bielsa’. BfF: Why is Bielsa so special? After all, he isn't won a lot of trophies? JD: Mauricio Pochettino, Gerardo Martino, Dario Franco, Diego Simeone, Jorge Sampaoli, Pep Guardiola - all have taken direct inspiration from Marcelo Bielsa’s way of thinking either in strategy or methodology. Indirectly hundreds and hundreds more unknowingly employ principles that were ignited by Marcelo Bielsa. At Athletic Bilbao, Newell’s Old Boys and Chile in particular, legacies were left behind him. Newell’s Old Boys even named their stadium after him ‘Estadio Marcelo Bielsa’ and have since hired from a managerial pool of those that represent the same school of thought as Marcelo Bielsa. 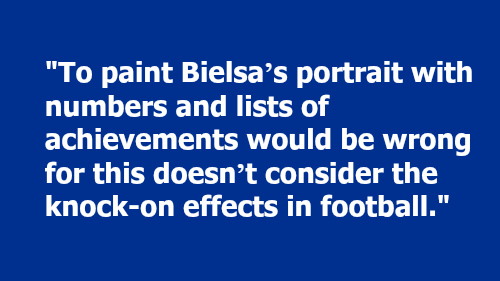 To paint Bielsa’s portrait with numbers and lists of achievements would be wrong for this doesn’t consider the knock-on effects in football and it wouldn’t give power to ideas that can transform how an individual can think about the game. Those who have worked with or closely to Marcelo Bielsa are unified in their opinion – Bielsa has a way of convincing others that there is a right and wrong in football, at least in the processes of bringing to life an idea. BfF: What is his philosophy? 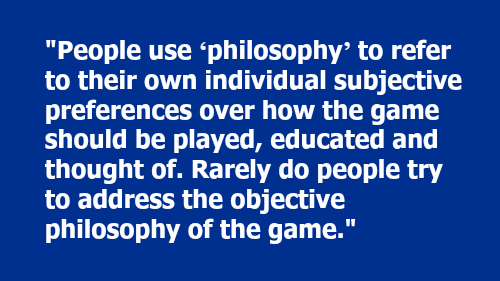 JD: The first angle to attack this type of question is to ask ‘what is THE philosophy?’, People use ‘philosophy’ to refer to their own individual subjective preferences over how the game should be played, educated and thought of. Rarely do people try to address the objective philosophy of the game. So if we look through the objective lens and make an attempt to theorise football on the pitch, we come to a set of broad undeniable and factual conclusions. The highest order of objectives when in possession is to score a goal, the ‘next best’ action is to assist goals. After these two objectives, we are looking at ‘assisting’ the assist. That is to say, we can use examples of playing players through into areas we can make assists from (wide areas within the box among others) or set the ball back to someone who can put someone through to score. After those three more obvious objectives, I find that many football coaches slip in and out of grey areas and start to fill in the order of objectives from a subjective angle. Each of these spaces provokes a different response from each opponent. This alone is an under-analysed area in football analysis. Should we not be able to (a) score, (b) assist, (c) assist the assist and (d) get into the key spaces, we are now looking at creating the conditions to achieve the objectives listed above. Simply put, we would find it difficult to achieve the objective listed in objective (d) for one or more of three reasons: the opposition are compact horizontally, the opposition are compact vertically and the opposition are layered in between their midfield and defence (or beyond). The three processes listed (to spread the opposition out vertically, to spread the opposition out horizontally and to remove the layers of the opposition) should make up the vast majority of your philosophical content. These three processes can be achieved through different levels of communication. Communication refers to the verbal and non-verbal interactions between two or more players on the football field (team level, unit level and group level). An example of group level communication might be to have your central defender drive out with the ball to attract one of the opposition midfielders, this moment then communicates to your team mate(s) where space may or may not have opened up now the opposition central midfielder is pulled out of his position (therefore removing compaction or layers). In this moment, we can think about communication in its simple form as a two against one (your central defender and a player behind the opposition midfield line against the opposition midfielder who has been pulled towards the ball and out of position). Of course this can grow and become more complex as other players can be involved in this moment. Your striker may want to run behind the nearest central defender, to prevent the central defender stepping forward to defend behind the central midfielder pulled out of position for example. Should none of the previous options be available to the player on the ball (objective A-E), then switching out of the area to another area is often considered as a way of finding new angles into the opposition block AND to move the opposition from one area to another. The final objective in possession is to retain possession and know that each new pass in the sequence returns to the highest orders of the objectives. Where Marcelo Bielsa thrives most, is in implementing the pictures and patterns for players that fit within this framework of objectives. In Bielsa’s own words, verticality, movement, rotation, concentration and improvisation (breaking the order of objectives) make up Bielsa’s implementation of the philosophy of the game. Bielsa is simply the mediator between THE PHILOSOPHY of the game and the players – different to other managers who start with ‘preferences’ as their starting point. Of course Bielsa has his own set of preferences for how he implements the philosophy – but this is on the level of application of THE philosophy, not the other way around. BfF: Bielsa’s concepts need players who can think about the game. First off, do you agree with that statement and secondly, how do you foster that? It’s clear that this is an area of great interest for the Argentine and an area he has explored well. Taking the first quotation into consideration (re: robots), Bielsa is referring to the human elements that bring about errors on a football field, or as Dr Raoul Oudejans would say (an associate professor at the Faculty of Human Movement Sciences at the VU University Amsterdam) “changes in attention which lead to a performance decrement”. Changes in attention can often be as a result of increased anxiety (which in turn comes about from responses to different levels of pressure). Marcelo Bielsa is someone that others would consider a ‘master in human motivation’ and guys like Sampaoli have even admitted to going jogging while listening to recordings of Bielsa’s interviews and team talks. One method to reduce the impact of ‘changes in attention’ can be to channel these moments towards detail. That is to say, we can create a series of checkpoints to focus on during any high pressure activity. Let’s take a penalty shot for the simplest example, we can take the whole activity as a process and just be part of that process and allow for us to ‘just be there’ and experience the moment as it is as we run up to take the penalty. Alternatively, using a method that many use for different actions across many disciplines, we can break the action into a series of mini-checkpoints: put the ball down, take exactly seven steps back and stand in line with an imaginary marker two yards past the far post and then as striking the ball with the instep to shoot across goal we should feel the sensation of the knee coming up to the balancing arm as our body remains compact during the strike of the ball. The checkpoint process allows for our attention to be placed into areas where our technique is important in this particular example, leaving no room for anxiety to creep in. In a similar way of thinking, it is possible to use the ‘languages of the game’ (or specific patterns) to bring together a collective set of minds during a more structured part of the game that might otherwise rely on the individual’s level of attention and decision making. So from this particular viewpoint, we can say that Bielsa would prefer players to play ‘without thought’, automatically. Bielsa also uses tools such as clear ‘roles and tasks’ for individuals on a football field, areas to place your focus. 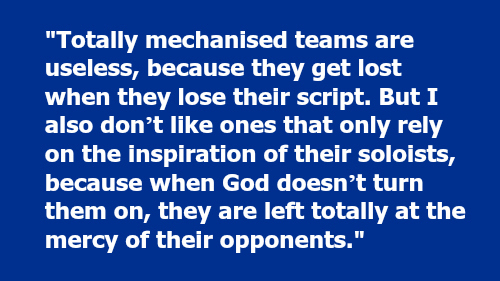 Then we move onto Bielsa’s second quote where he clearly expresses his dislike for totally mechanised teams that follow a script. So there is a balance here, between Bielsa and the players. A player who goes against the script or a player that improvises is a clear component that Bielsa not only encourages but plans for from a higher level of planning. The idea is to create clearly unique player identities within a team and in doing so, creating a better platform for communication (verbal/non-verbal agreements) to succeed in a game of football. Players are not equal, not in personality, not in technical expressions, not in game understanding and so on. Some coaches exist on either end of this scale, some are strict in their scripts and models of the game (Louis Van Gaal) while others allow for player ownership over their game and ideas, but within an agreed style of play (Arsene Wenger). Bielsa is constantly sliding up and down this scale, somewhere between the two, somewhere in the grey area of Bielsa’s scripts and the resistance of player improvisation. To foster such an environment, the players must know the script before then can move away from it with freedom, players must know their own player identity and how that fits within the bigger picture – players must understand the game. Not all players will understand the game on the same level of understanding, that is to be accepted and some players need more to be moulded around them and their intuitive preferences. It’s a question of human management. Luckily for Bielsa the game isn’t played by robots, because it’s part of the game that Bielsa clearly finds fascinating and challenging. Through our struggles we learn most. BfF: What is the biggest lesson that coaches can take from him? In particular coaches at either youth level or who coach for the fun of it? 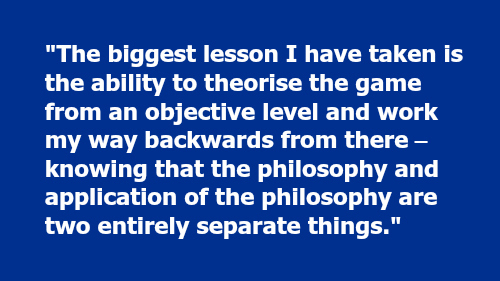 JD: The biggest lesson I have taken is the ability to theorise the game from an objective level and work my way backwards from there – knowing that the philosophy and application of the philosophy are two entirely separate things. From an implementation standpoint, I think we can all learn how to better mediate between the philosophy and your players more. You, as the coach, can zoom out and step out of the situation in your coaching. Bielsa’s training methodology is both very simple and often directly relates to the philosophy of the game – creating automatisation (action without though: automatically) in areas but then allowing for individual improvisation to break these rules within the game. Better than that, demanding that of your players. I think if coaches thought about the game as their starting point along with creating better player identities we’d be far more successful in what we do. Too many have other objectives held on a higher level than those two components. BfF: How will the book be structured? Will it be simply coaching sessions or will there be more to it? JD: The book is heavily theoretical but then followed up with over 50 related training sessions that absolutely will not work without the coach’s prior understanding of the objective of each session and how it fits in with the bigger picture. I would say to anyone looking to just find training sessions to implement – turn away now and do not buy my book. It’s designed to provoke thought from the reader and hopefully create a reaction of acceptance or rejection. I would be disappointed if anyone read the book and agreed with absolutely everything I’ve written – especially as large parts of it discuss football philosophy within the context of application. The book demands some work from the reader in certain areas as I have left some theoretical solutions in their ‘application form’ from case studies. Bielsa employs principles that are not exclusive to him alone, they are part of football and examples of his philosophy exist within so many teams. This is especially true since Bielsa’s starting point of study was ‘football’. So for this reason I’ve looked at how other teams employ the same principles, form example how Wales under Gary Speed used their full backs to get their best players on the ball in the best spaces to showcase their individual player identity (receiving the ball with the defender in front to run at). The last thing I wanted was for coaches to read a book that both theorises the philosophy Bielsa follows and then copy his application of the philosophy. The idea is to promote thinking about the game like Bielsa and then look at your own opportunities and barriers of implementation within your own level of application. Therefore, creating something meaningful. I want coaches to be better theorisers and to form their own approach within their own skillset as a coach – all within the objective framework of the game that Bielsa has spent a lifetime theorising. BfF: Have other coaches helped in the writing of this book? JD: To write a book like this in isolation is impossible. I have reached out to many and sat them down to discuss football on a philosophical level to try and theorise each individual and tie them to the structure of thinking I’ve outlined previously. I received so much information of how to better create conditions to then penetrate between lines for example – these same coaches may not be aware of their bigger picture but they certainly have many great ideas and examples of application. Unfortunately, the few most influential people I spoke with were not able to put their name to their words, however, they were very open with helping me tie together my thinking. We have to respect those who are in this position and yet they still choose to educate others and better than that, explore with you their thinking as they haven’t yet made sense of it all yet. I’ve always believed that we should learn from the best teachers we have around us. That is to say if we have an expert on ‘creating teams’ within our reachability we should learn from that individual, if we have an expert on ‘food’ then we should look to learn from them and take away what we can for our own field. Not enough people do this. I’d implore you today to think about any world leading expert in any field you have around you – someone that eats, sleeps and breathes their expertise and oozes with passion – ask to meet them and get a window into their way of thinking about achieving excellence in their profession. If you can’t take something away from that person, then you’ve failed. My book has been influenced and had the help of more than just football coaches. But everything has been put back under the reference of ‘football philosophy’ and within Bielsa’s way of thinking. BfF: Finally, you're going through Kickstarter to crowd fund the printing costs for the book: why is that? JD: Going through Kickstarter hasn’t really been done as far as I know for this type of book, which is insane given the social media explosion of coaches and analysts over the years. I believe that by opening this door for crowd funding books, we’ll hopefully see others follow and write the books that we all want. Many of the most popular coaching books to date follow the same guidelines – this is a real opportunity to do something different. I’m now able to format the book and showcase information in the way I see best to achieve the book’s objectives. Going under any publisher means making sacrifice and making more of a consideration towards maximising profits or fitting within their current ‘this is how it is done’ way of thinking. This isn’t to have a dig at any of the publishers out there but it is a way of finding freedom as an author to keep the message pure – to commit myself as the author to learning and keeping everything else secondary. I’ll be backing projects on Kickstarter I see in the future that I think have made a real commitment to learning on a higher level. No questions asked. Within the first week we’ve reached nearly 90% of the overall funding needed to print the number of books we wanted to. This has been pleasing and shows it can be done! I’m sure it won’t always work out and I fully expect a future project of mine to fail done this way, but that’s ok – since the purpose of writing the book in the first place wasn’t to profit from it anyway! I’ve been thinking a lot on the subject of implementing ideas and the process of coaching lately – how we can install change, how we should manage change, how to plant seeds in the minds of players so they grow into firm beliefs and so on. This is without a doubt my next area of obsession, whether that materialises into a book that succeeds or not we’ll have to see but I’ve already made my commitment to learning on this and starting meeting coaches who are world leaders in this field. With Kickstarter we have a future platform for the idea to grow – for anyone who loves ‘ideas’, Kickstarter is a wonderful resource. Further information on 'The Philosophy of Football: In the Shadow of Marcelo Bielsa' can be found here. We need your help to keep Blueprint for Football running and ask those who can afford it, and who feel that the material we have produced and continue to produce is worth something to you in return, to pledge $2 per month (or more if you wish). Check us out on Patreon. I've got to say I've followed Jed since around 2012/13 on his Twitter account and his work keeps getting better and better. I've been fortunate enough to then see him present and see him coach. A world class person before anything else and has given up so much of his time to help me and others I know too. I've already ordered the book and cannot wait to get stuck into it! best of luck Jed! great interview Paul! Jed is really making a name for himself within coaching and I hope this continues as I have similar outlook on football and I worry that football is venturing towards pace and power over technique and tactical awareness. Brains is always better than brawn! Goo luck Jed and great interview!